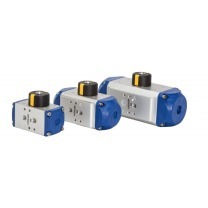 View our wide range of quarter turn actuators. Quarter turn actuators allow you to automate different ball- or butterfly valves. They can be operated electrically or pneumatically. A pneumatic actuator is also available with a spring what means the valve goes automatically back to begin position in the event of power failure. If you want to modulating the flow, an electric actuator is recommended. The actuators can be mounted on valves which have an ISO 5211 flange.